I wanted to cook a big family dinner this Sunday, reminiscent of my childhood, when my mom would cook a delicious, drawn out meal, usually an Italian dish. One thing that has been really difficult about going low FODMAP is not being able to eat Italian food the way I want to. I’ve experimented with sauce, and with meatballs, but it always tastes like something is missing….something specifically being garlic! 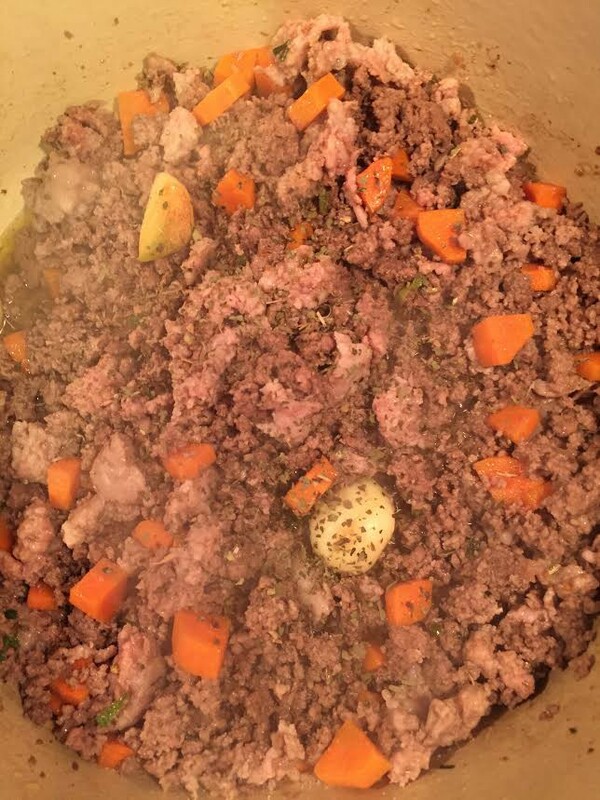 This weekend, I decided to try my hand at modifying our family bolognese sauce recipe. phase 2: add the meats! ready to consume! look at that beautiful color! 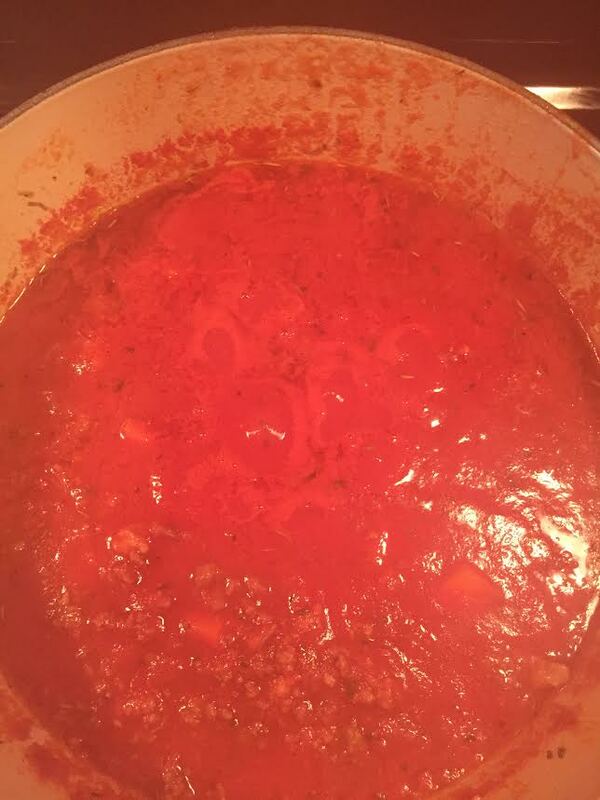 This sauce recipe has been a part of my family for generations. My great grandmother came from Northern Italy, and brought this recipe with her. All who make it modify it a little bit, for personal tastes or food allergies. Now, it’s my turn! I made this completely low FODMAP friendly and it tastes just like the original! My great grandma would be proud! Instructions: Heat a large pan or Dutch oven over medium heat. Add 1 tbsp of olive oil. Heat for 2-3 minutes. Add onion pieces, stir. Add garlic and carrot. Cook for 10 minutes, remove onion and garlic pieces. Add chives and scallions. Add ground sirloin, cook until brown and crumbly, stirring frequently. Add Italian sausage, cook until no longer pink. Add garlic pieces back in. Add water, basil, salt and pepper, and cook for 2 minutes. Add in Italian herbs, rosemary, tomato sauce, tomato puree, and cheese rind. Bring to a low simmer and cook covered for 1-2 hours. Uncover and remove garlic pieces. Serve sauce over your favorite gluten free pasta! 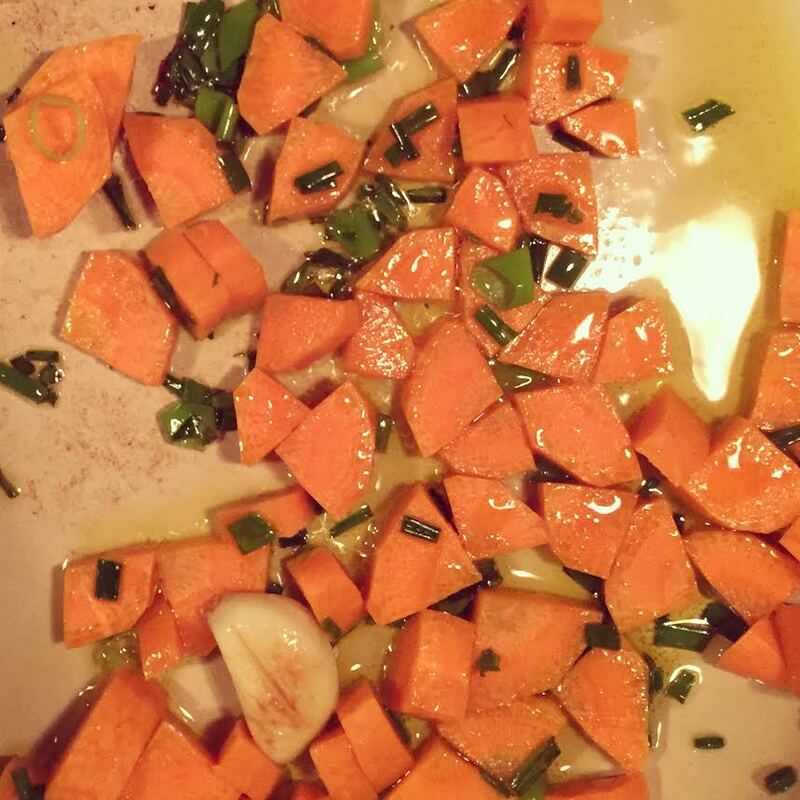 I made buckwheat-sweet potato gnocchi to go with the sauce, but I ate it before I could take pictures. But it seems the process pictures speak for themselves! This sauce is best when it’s been cooked over low heat for 2-3 hours, but is quite tasty and delicious after just 1 hour of simmering. *Italian sausage is not always low FODMAP, because it usually has garlic and/or onion in it. However, it is easy to identify and pick out of the sauce. I added it in because my husband loves it, but this recipe would be just as yummy without it. How’s your low FODMAP life going?